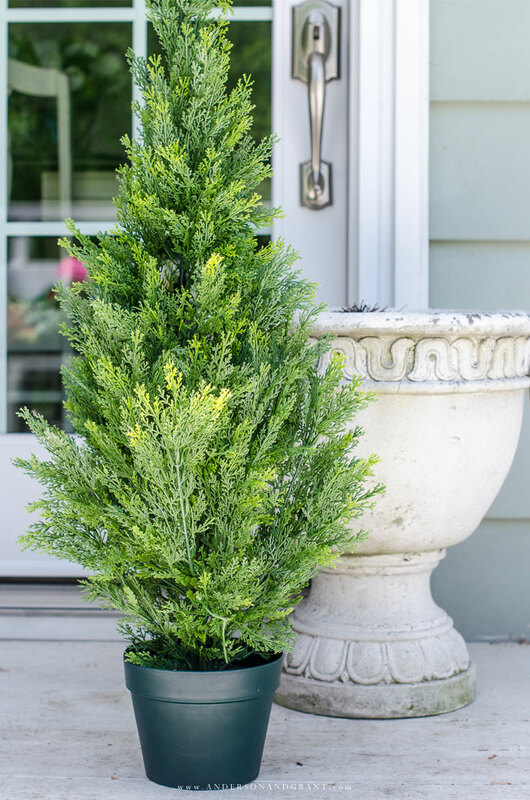 Faux shrubs and bushes are a great alternative to the real thing when planted in pots and containers for your porch. 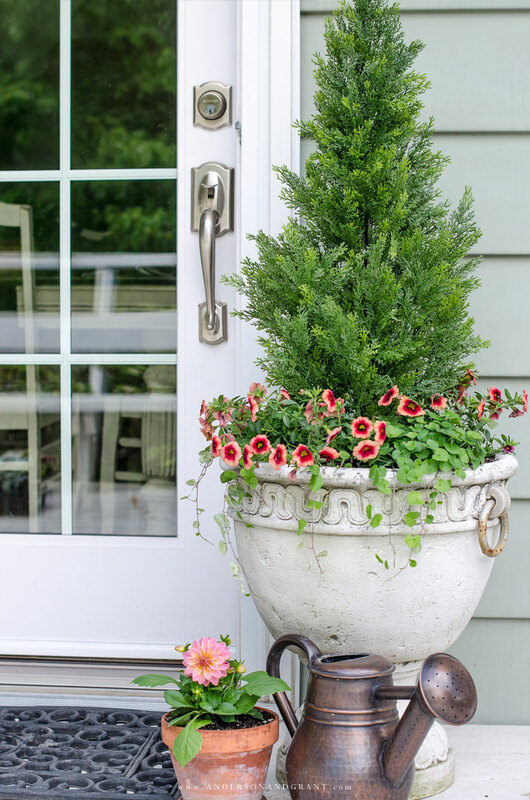 Learn where to find these plants and how to make them look as real as possible to easily enhance your home's curb appeal. 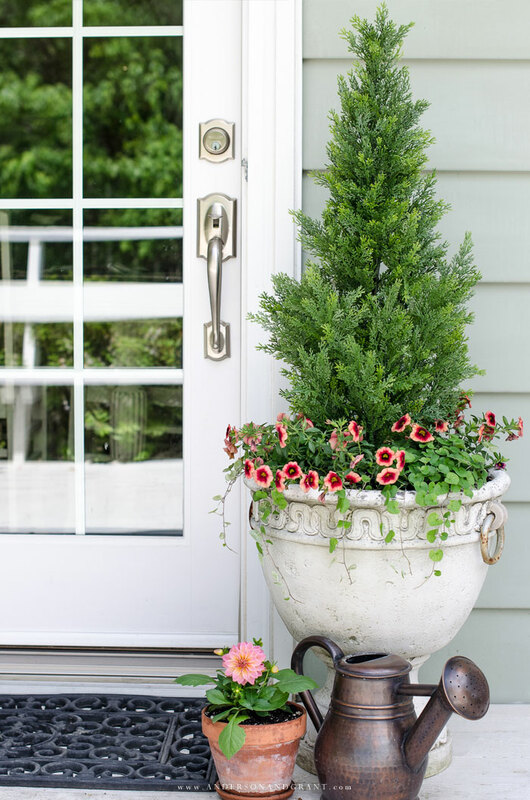 An easy and cost effective way to add curb appeal to your front entryway is through planting flowers and shrubs on your porch. 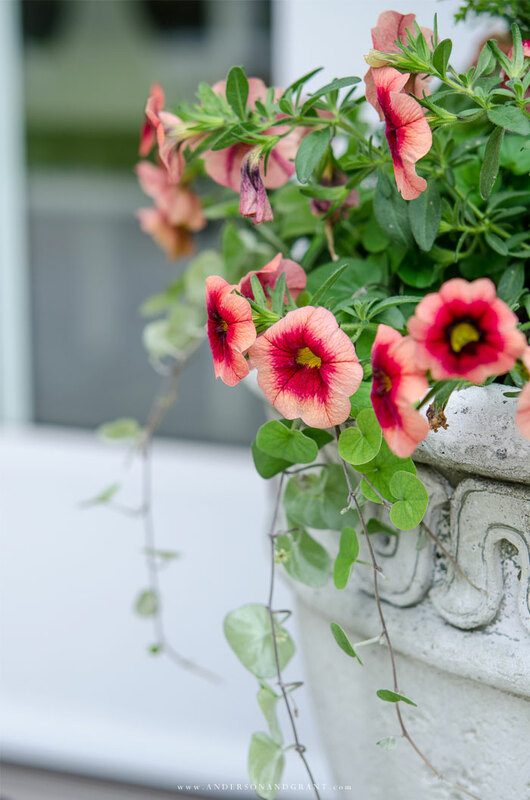 Flowers add color and variety, while growing things like arborvitae or boxwood in containers adds natural beauty year round and creates height in your plantings. 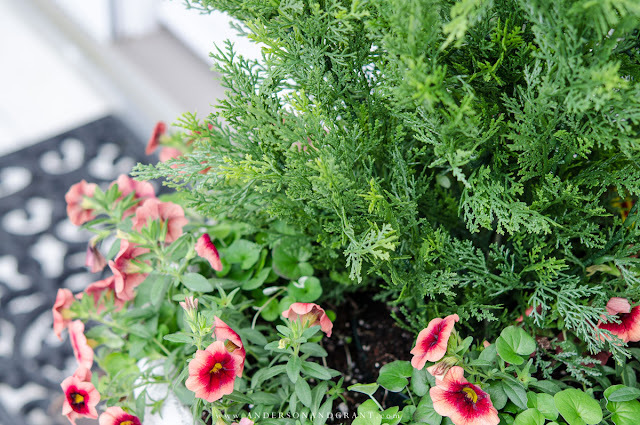 But bushes and shrubs can be tricky to keep alive and thriving in containers. These living things need adequate water and light in order to look their best. And if there is anything worse than no curb appeal, it is curb appeal that looks like it hasn't been taken care of. 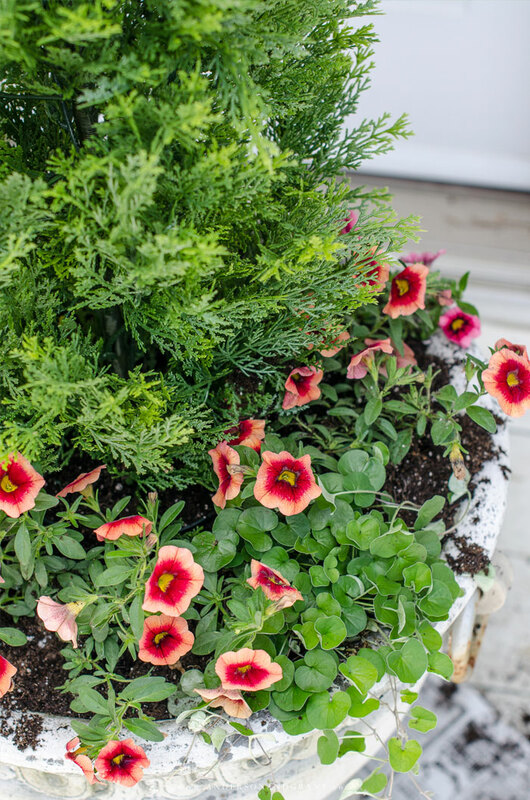 There is a convenient solution for those of you who love the look of potted bushes and shrubs, but don't like the upkeep. It is especially helpful for those claiming they weren't blessed with a green thumb in the garden. This solution also eliminates the problem of your shrubs being damaged by bugs or eaten by a friendly neighborhood deer. The secret to having lush greens growing on your porch? Faux shrubs and bushes! 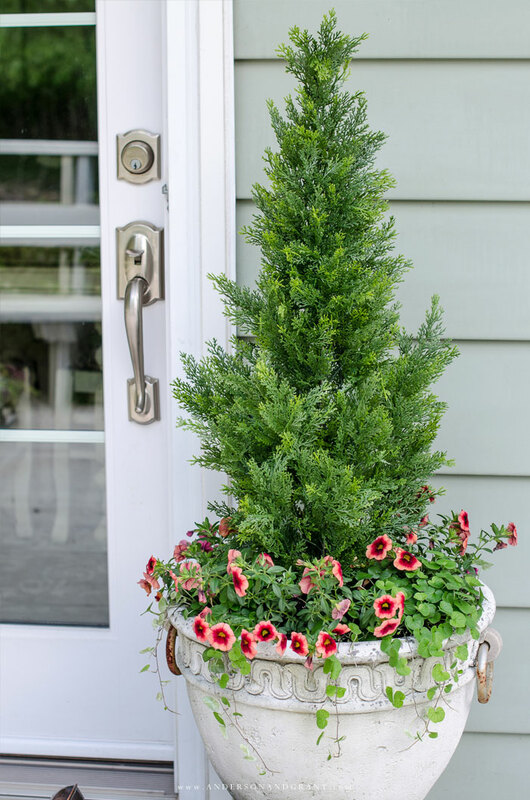 While I'm not instructing anyone to landscape their front yard with fake trees and artificial flowers, it is a nice alternative to grow shrubbery successfully in a few pots on your porch. These aren't the gaudy looking plastic plants that were once commonplace years ago. Many are very realistic looking. 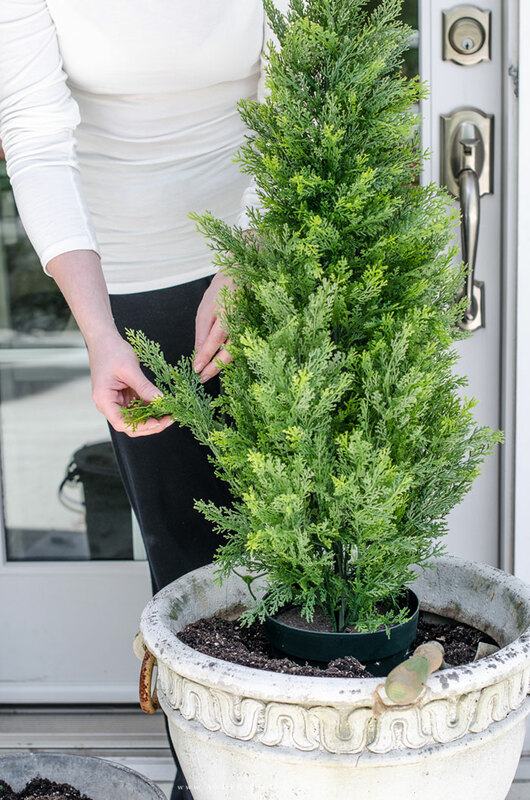 You can purchase different types of bushes like boxwood and juniper, and they come in different sizes and shapes. There are even fancy shaped topiaries that you'll never have to trim or maintain again. 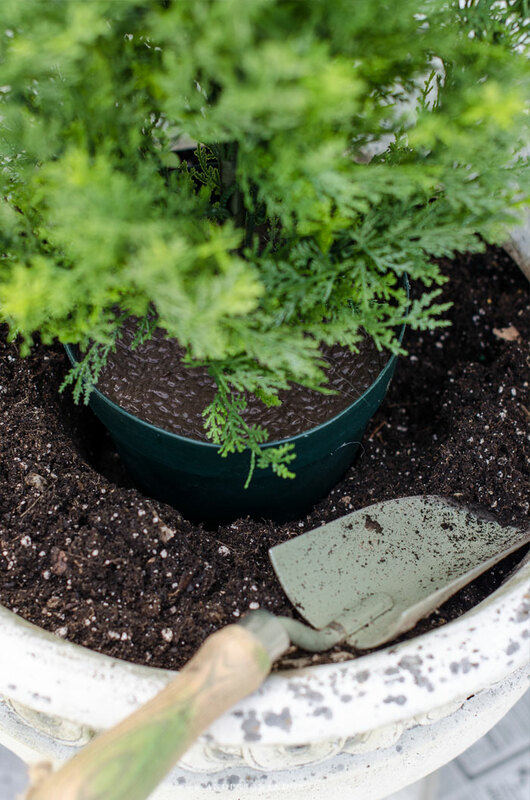 One way to make the shrub appear more realistic is to plant live plants around the base of the tree or in additional pots surrounding your container. The size of the planter determines the size of the plants that can be added in. You want to be sure that they have room and enough soil to grow. 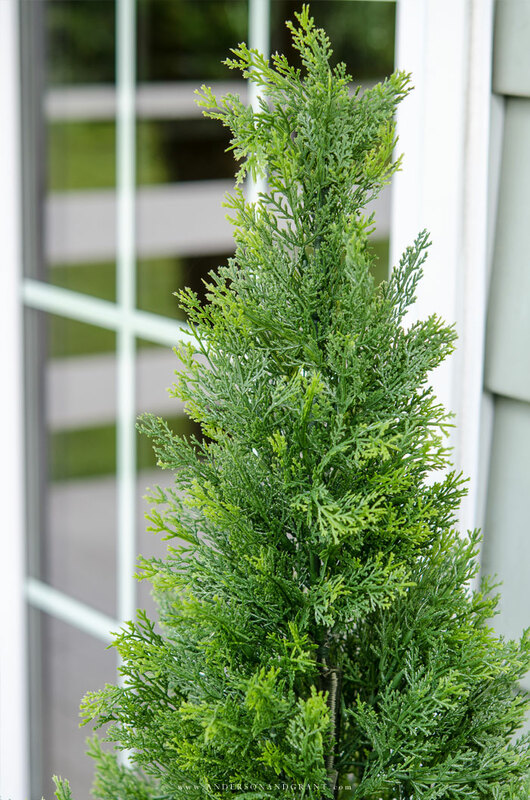 The arborvitae that I purchased came from the garden department of a local department store, but you can also find them online at various price points. As you can see, mine has a very basic pot on the bottom, and since I already had a very large urn to put it into, that didn't matter to me. Some versions (like these topiaries available at Pier 1 Imports) have fancy bases that you can place outside as is. Just as with planting a live bush or shrub, I dug a hole down into the dirt filling the urn where my artificial version could be placed. I was sure to dig it down in far enough so that the plastic pot wouldn't be sticking out anywhere drawing attention to the fact that the bush isn't real. It also needs to be securely down into the dirt so that the wind doesn't knock it over. I did a little "fluffing" and arranging to spread out the branches of the arborvitae. Then I added more dirt into the urn completely covering the plastic pot I planted. You'd almost think this was a live shrub planted in the dirt, wouldn't you? 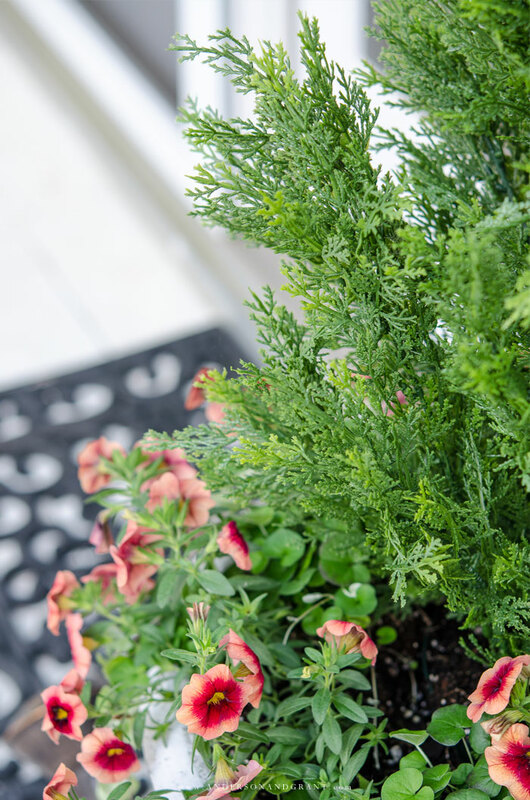 Following a trip to my local nursery, I choose green dichondra (called "Emerald Falls") and a peach and orange calibrachoasto ("Confetti Garden Hawaiian Hula Lili" ) to plant around the base of my shrub. 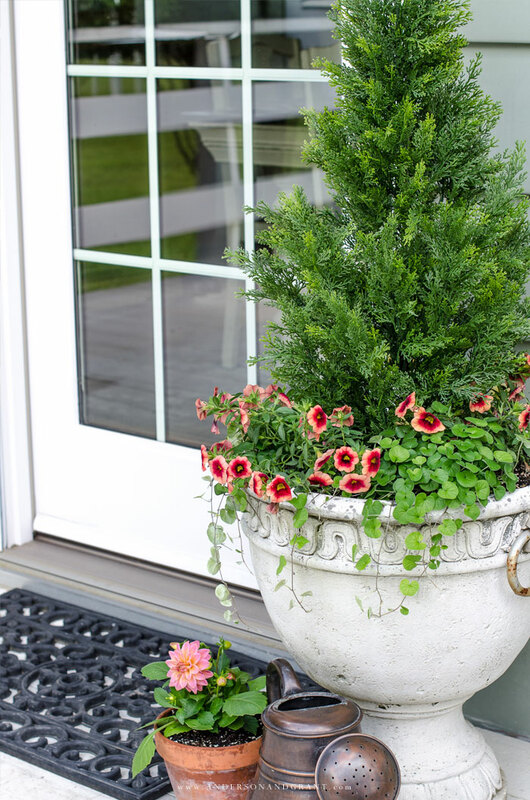 I chose these two because the dichondra will fill in and drape down the front of the urn as it grows, while the colorful petunia-like flower will fill in growing up and around the base of the arborvitae. 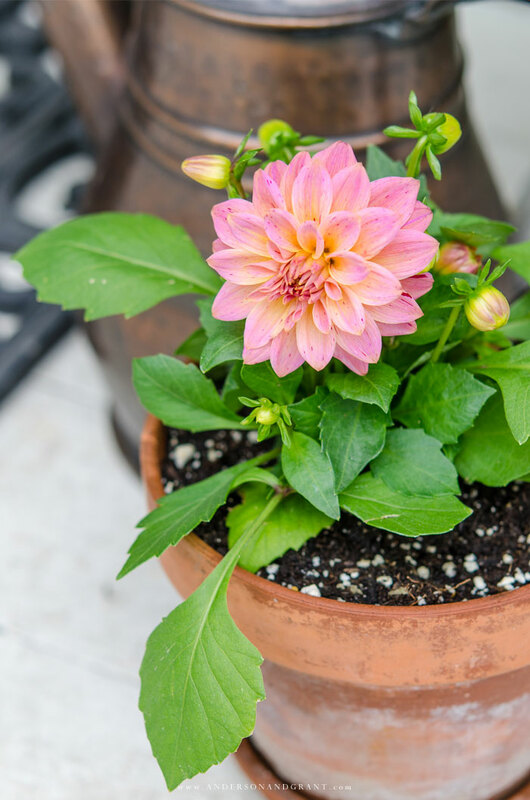 To finish off my front porch display, I also planted a coordinating colored dahlia in an aged clay pot. All three of these flowers can handle the full sun they will see in this location. 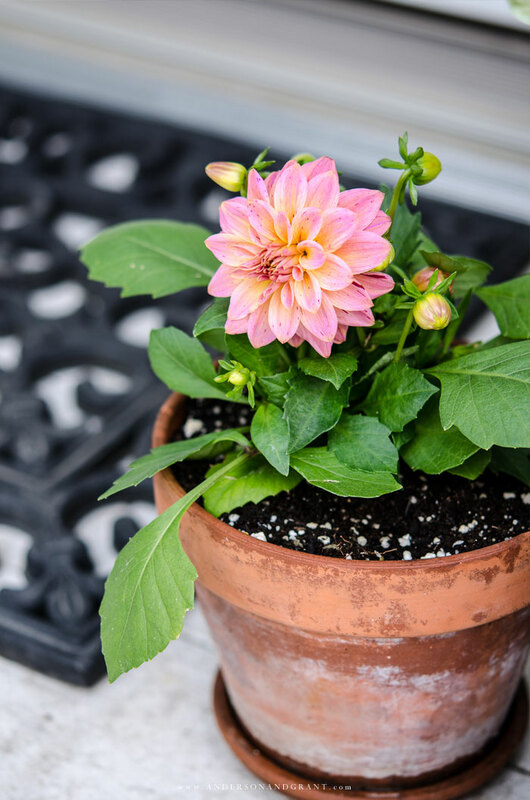 It is important to choose flowers that will grow well based on the conditions where they are being planted. 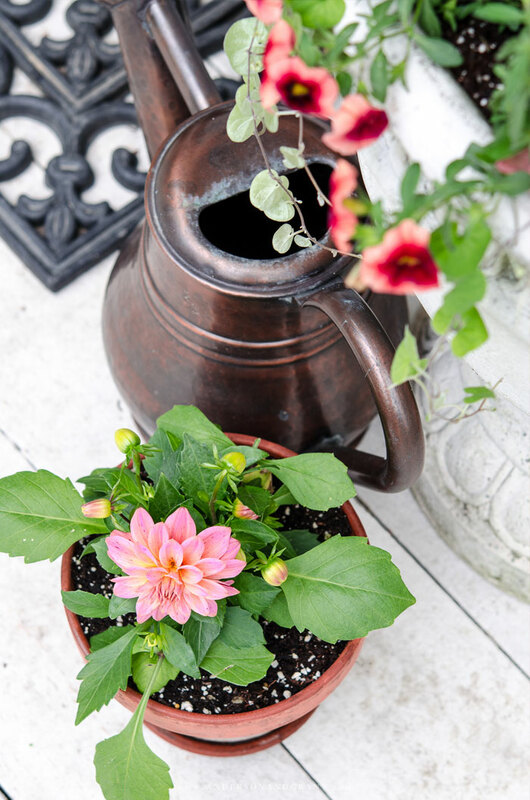 If you are planting different species in the same pot, you also need to choose plants with similar watering needs. So far, I couldn't be happier with how the entire urn looks and it has been so easy to maintain. Each morning before I leave for work, I give some water to the plants and deadhead any blossoms that have faded. Fingers crossed that I keep this up all summer long! 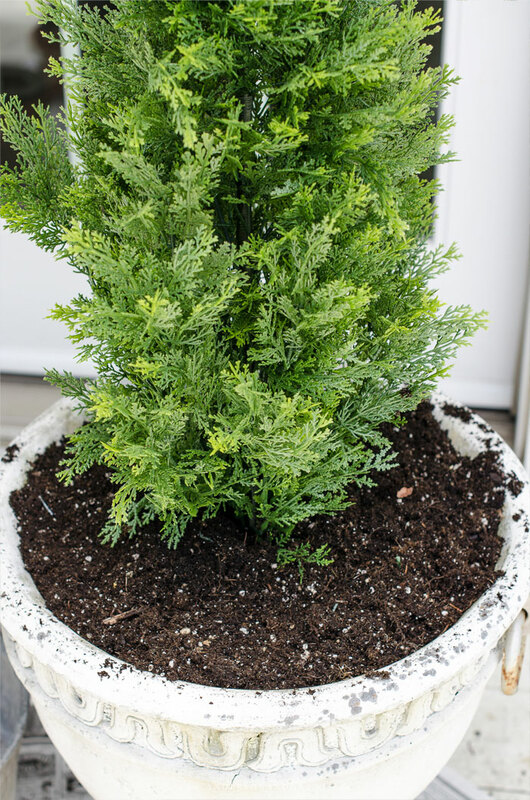 While I know this idea isn't for everyone, it really is a great solution for those of you who want the beauty of shrubs and bushes growing in containers without the work of keeping them healthy. There is so much to do and take care of in the summertime and this is one way to minimize what needs to be tended to.